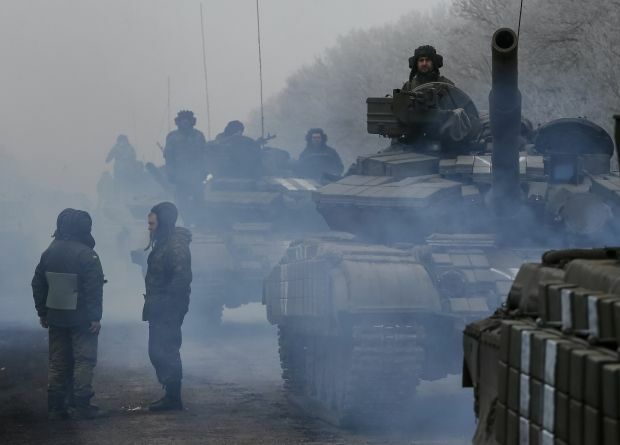 Soldiers of Ukraine’s Kyivska Rus battalion said on Tuesday they would be able to maintain their positions near Debaltseve for a maximum of 12 hours, and without reinforcements they may all be killed, journalist Olga Germanova has reported on her Facebook page. Earlier it was reported that fierce fighting continues in the areas around Debaltseve, while the Ukrainian military claimed to have regained control over the village of Logvinovo. Germanova said in her posting, made just before 1400 Kyiv time, that she had received a plea for help from Ukrainian soldiers in the village of Komuna, immediately to the west of the town of Debaltseve. According to a Facebook posting made on Tuesday by Ukrainian journalist Andriy Tsaplienko, the Russian-backed militants have seized the railway station and the local police department in Debaltseve itself. The fact that there was fighting at the railway station was confirmed by ATO spokesperson Andriy Lysenko at a briefing in Kyiv on Tuesday. "The Ukrainian military control the village of Logvinovo, and also partially control the road to Debaltseve. There is fierce fighting on the outskirts of the city now, there is a tense situation in the area of the railway station, but our military are holding their positions," Lysenko said. He denied reports in some Russian media that the Ukrainian military have allegedly abandoned their positions near Debaltseve due to losses. "The enemy is losing more and more people, as well as equipment," Lysenko said. Photographs have been posted on the Internet allegedly showing Ukrainian army equipment abandoned in Debaltseve. UNIAN is unable to confirm their veracity. Earlier, the Ukrainian military denied reports that its troops in Debaltseve had been surrounded by the Russian-backed militants. However, journalists and a team of OSCE observers have been unable to reach the town, with both sides saying it is not safe for them to go there. A ceasefire in the Donbas was supposed to have come into effect on midnight on Sunday, but Russian-backed militants have continued to attack the Ukrainian forces in the town, according to multiple reports from the area. Representatives of the militant organizations in the Donbas, whose leaders signed an agreement on a ceasefire in the Donbas at last week’s peace conference in Minsk, said on Monday that Debaltseve is not covered in the agreement, as it is not specifically named in the text. The failure to secure a ceasefire has stalled the withdrawal of heavy weapons from the front line between the two sides. Both sides were supposed to have pulled back heavy weapons within 48 hours of the ceasefire, but neither has, and fighting has continued.